The Mobile art(ist’s) book library is based on artistic activity, love for public libraries and the desire to make visible the hidden and forgotten textbased works made by artists. 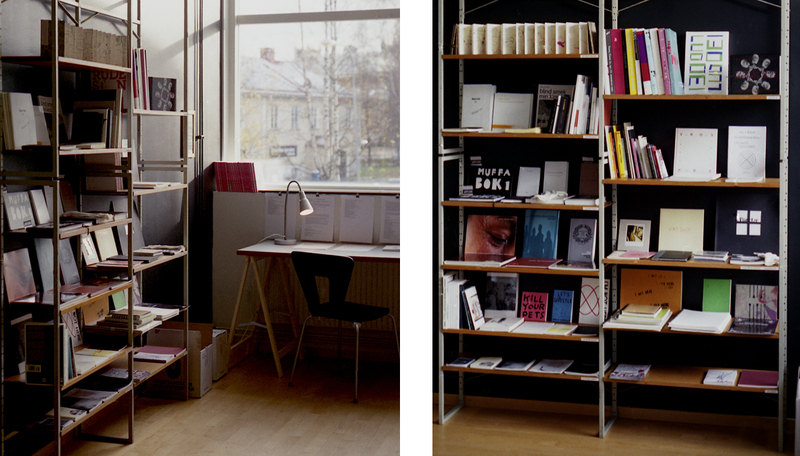 The plan to organize and gather a mobile library for art books took off with a mission for Vita kuben (the White cube), Norrlandsoperan in Umeå in 2010.Vita kuben is a space in the environment of the Opera for visual and sound artworks. Head of department for Vita kuben Tina Eriksson Fredriksson invited artist Ulla West to set the program for Vita kuben during the autumn 2010. The first version af MABL, Mobile Art(ist’s) Books Library was built up outside Vita kuben. The word library is meant an organized collection of information made available, for reading and often but not always for lending. The first libraries consisted of archives. The Mobile art(ist’s) book library is not a permanent collection of unsystematized and uncategorized books. These books are not for lending but for availability. Many of the books are borrowed for the different occasions, directly from the creators/copyright persons or from different publishers. A prerequisite is to keep the permanent collection under development, keep it handy for practical and financial reasons, which means not a traditional growing archive. Contemporary art(ist’s) books are stretching from the book as artistic craftsmanship and letterpress printed unique objects or art objects in limited edition, from political magazines and comics, printed books of poetry, sculptural works and other visual representations, concrete poetry and various magazines and fanzines to intangible art events. And more. Art(ist’s) books are often unique, special, chosen, not so easy to find outside the art context, which helps give the book its special value. Of course, the intention for an artist’s book project also may be to mass produce. The question of distribution is a vital part of the concept of the book. The textbased artwork is coordinated in the process as a whole. Digital technology offers new and different opportunities to both broaden, complicate, limit and/or simplify the development. A book may be the only permanence, the only visible result from an artproject. An artist book may of course be the work itself, the whole work. MABL work with textbased artworks, intangible and/or timebased artworks and sound artworks.